Noise is all around us, in our job, home and environment. We cannot escape noise. Even when we are in our own homes and all is quiet and we cannot hear anything outside there is still noise going on. Each individual has to decide for themselves as to when noise becomes too loud or irritating, or when it makes us cringe. A person who is partially deaf has to have what they want to hear louder than people with normal hearing. 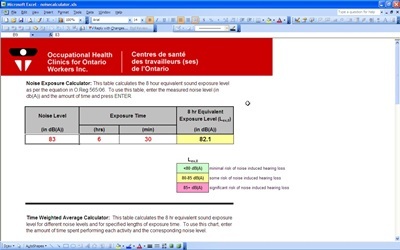 A noise calculator can help to determine when a particular noise is becoming too loud. By having noise that is constantly too loud can cause damage to the hearing over a long period of time. People who work in certain occupations are more apt to end up with a loss of hearing due to the type of loud machinery that is used in the occupation, such as a drill. People will wear ear plugs to avoid the loud noise and other people may not feel that ear plugs are necessary and do not notice the hearing loss until it is too late, and end up having to wear a hearing aid that could have been avoided if precautions had been taken. People who have music turned up too loud in their cars, trucks or other musical devices are taking a risk of losing their hearing at an early age. A noise calculator can help people to know when a particular noise is becoming too loud. If you have to have things turned up louder than everybody around you, that is a good time to check your hearing and obtain a noise calculator to determine exactly where your hearing limit is. Taking care of your hearing and health now will help you to keep your hearing in the future.